Like in any war, victims are usually the vulnerable. In the crypto space, the hash war between different factions within Bitcoin cash network saw ordinary investors’ record massive losses in several hours of madness. 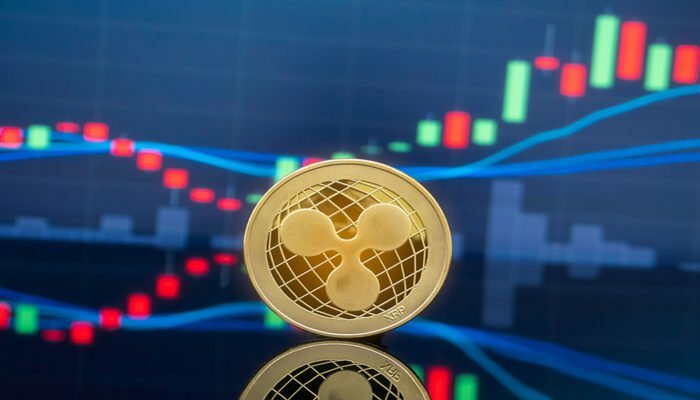 Surprisingly, in the midst of double digit losses in Bitcoin and most altcoins, XRP registered minor losses, rapidly recovering and closing three percent lower in the last week. Relative to other coins, this is impressive performance depicting how immune it is against BTC price movements. Inherently, the Ripple Ledger is different than most blockchains. Without incentives, validators wield no power unlike Bitcoin or Bitcoin Cash miners. Though there are flaws as constant accusation of centralization, their decentralization strategy is paying dividends. Furthermore, the network is generally power efficient XRP remains a tradable asset and a utility. These hash wars highlight why everyone should dump BTC and BCH and just put all their money into XRP! At the back drop of panic sells and steadying XRP prices rejecting meltdown below 40 cents, Ran NeuNer, a host at CNBC and a licensed trader directed investors to reduce their BTC and BCH coin holdings. To hedge against miners, investors should instead add their XRP holdings. From a neutral observer, this is coin shill but a level deeper, CoinBase Custody will in coming days offer institutional custodial support for among other coins XRP. Like it has been the case, this is fuelling speculations that the exchange could list XRP weeks after receiving $300 in a successful Series E funding. 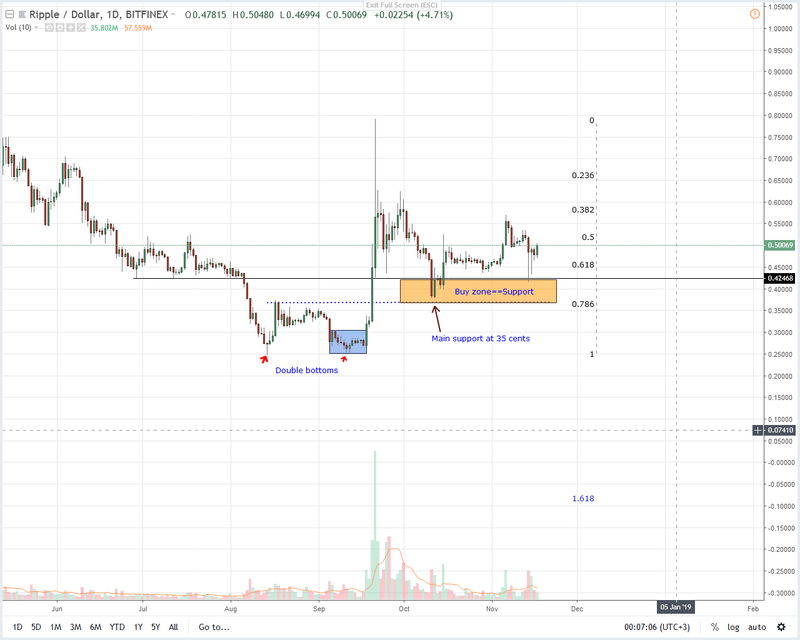 If this be the case then XRP prices could exponentially expand breaching several resistance levels in a CoinBase effect. 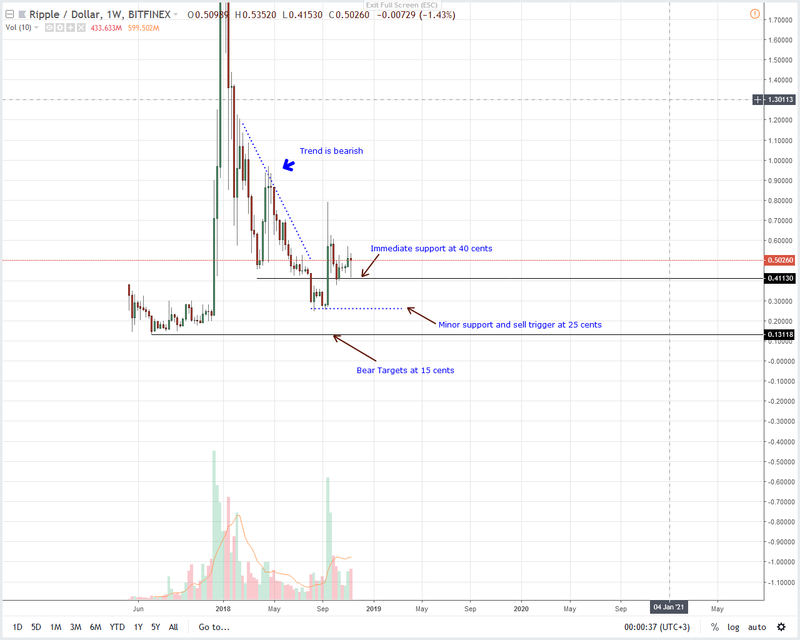 After flipping Ethereum as the second most valuable coin, odds are XRP/USD could further expand. This is not only from favorable fundamentals but from technical candlestick formations that point to higher highs roughly two months after superb gains of Sep.
From the chart, we note that the long lower wick points to underlying demand since prices are still trending inside our ideal buy zone since XRP bears didn’t drive prices below 40 cents—an important support previous resistance level, aggressive traders can begin ramping up at spot prices with stops just below 45 cents. On the flip side, conservative traders can wait for convincing high volume close above 60 cents—the 38.2 percent Fibonacci retracement level anchoring on Sep 2018 high low in line with our previous XRP/USD trade plan. Solid gains above level and traders can begin buying at spot with first targets at 80 cents and later $1.65 with stops at 50 cents. As long as XRP/USD is held within Sep 20 and 21 high low then bulls have an upper hand. As aforementioned, traders should look to take long position and after yesterday’s solid bull bar, we suggest buying at spot with stops at 45 cents with first targets at 60 cents, 80 cents and later $1.